No idea what to do with that neon blue eye shadow, or what to pair with those bright orange heels at the bottom of your closet? Eloquii has you covered. 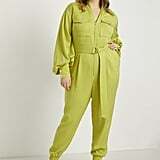 The chic, curvy fashion brand has teamed up with celebrity makeup artist Priscilla Ono and Beautycon to put together a 12-piece Summer collection for sizes 14 to 28 that's all about looking good and feeling great — and we've got our eyes on that neon green jumpsuit. "Beauty, to me, means confidence. 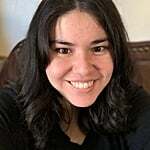 I've never been ashamed of my size; I've never been ashamed of my background; and I wanted to do who I am justice by being really great at what I do," Priscilla said in Eloquii's announcement video. 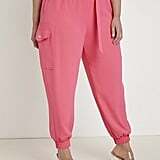 Available in a range of bright and vivid colors, the Eloquii x Priscilla Ono collection is the brand's first collaboration with a makeup artist, and her passion for color is shining through in every sheer top and flowy palazzo pant. "These pieces were designed so that you can mix and match with your current wardrobe. 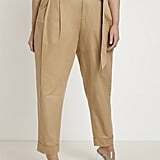 I really love this vibe where it's utilitarian yet feminine. That is what our collaboration really is." For Priscilla, the collaboration with Eloquii was especially important to create a space where curvy shoppers can feel confident and be bold in their style choices. "We're all about diversity. We're all about empowerment and celebrating your size and how you look," she said. "For me, as a makeup artist, when I give somebody that confidence — when they look great and when their outfit is right and when their hair is done right and they just have this beaming confidence — it just ricochets back into me and it makes me feel great." Most importantly, Priscilla said this collection is meant to inspire everyone to "wear what you want, look good, and feel good in it." So prepare yourself for a bright Summer and shop the entire collection ahead.